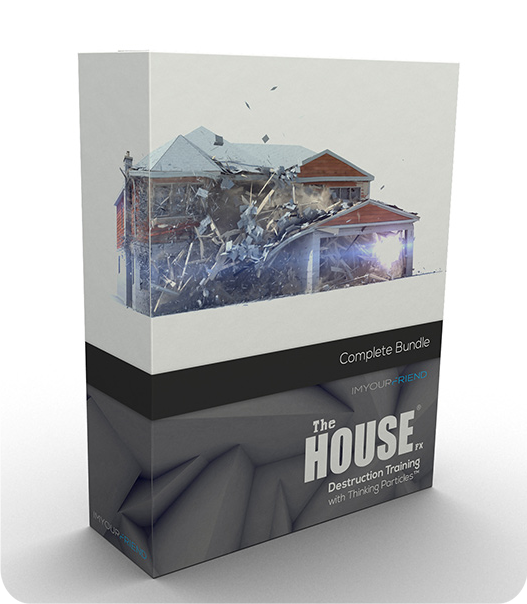 TheHouseFX is now available for download! This training was designed to show what it’s like for an FX Artist inside a CG Pipeline. With a directory structure based off working industry pipelines, you’ll learn how to manage and organize your project so you’re ready for a studio pipeline. Over 10 hours of in-Depth tutorials that cover destruction with Thinking Particles for beginners to advanced levels. Multi-Layered house model built specifically for destruction. Materials, Texures, and ID’s already to go. Hi-Res & Low Res options included also. Will is one of the coolest FX guys I’ve ever met. We are all really lucky to be able to know his techniques from this training package! Will Wallace is one of the most talented and inspired FX Artist I have ever worked with, I definitely recommend this training to anyone interested in getting into the industry.